Easter is just around the corner, so I thought it would be fun to make an easy and quick Easter project. I have a thing about bunnies.. They are just so adorable.. Last year I made this burlap bunny Penny that came first in the Royal Manx Agricultural Show last year in the soft toy category! This year I wanted to try making some bunnies from pom poms.. Here is what I did.. 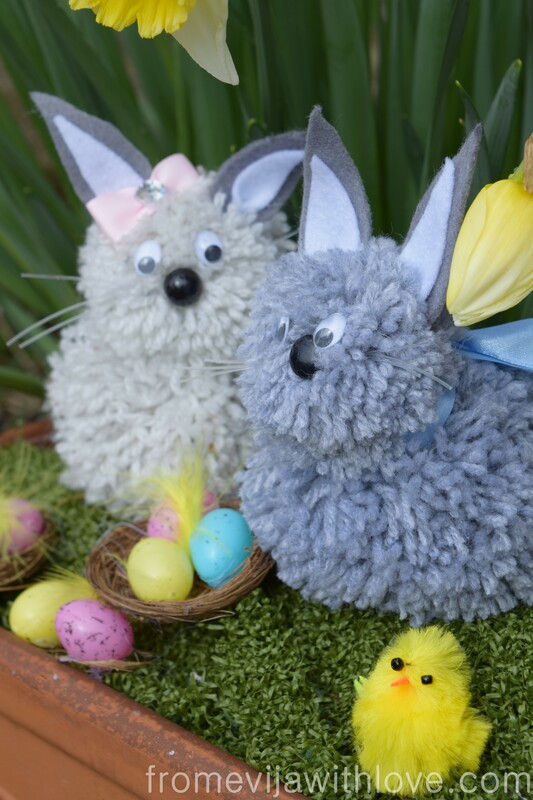 I remember making pom poms when I was younger and I always thought its such a fun and easy way to make something cute and it would work perfect for creating some bunnies. I chose the yarn in two shades – grey and one off white. You can get gadgets nowadays for creating different size pom poms but I went with the good old fashioned cardboard. It’s simple and easy and most importantly, you probably have a piece of cardboard at home already! I cut out two different sized squares – 1 for the body and 1 for the head. This picture explains step by step how I made the pom poms. I then glued the pom poms together to create the bunnies. I cut out some ears out of felt and glued them together. Then I glued the ears in place and added the eyes, nose and whiskers. The whiskers I created from some fishing line and glued in place.. Then I added some ribbons to ‘dress’ them up! And the two bunnies were created – Meet Ronnie and Reina** my two Easter Bunnies. ** Ronnie and Reina – I always give names to my creations and I spend hours searching for the right ones as if they were babies.. well they kind of are my babies.. So my husband came up with the boy’s name – Ronnie (hmmm snooker fan of course named after Ronnie O’Sullivan) and Reina – my friend came up with it as it is a traditional Manx name and I thought it had a nice ring to it, don’t you? Soo cute! Where do you find the time, lol! Now that I’m back at work it seems every spare moment is spent running around my 5 year old, husband and house. I so need some craft time! Thank you Becky.. it is so much fun making them, your girls will love it!! Well aren’t you cute to name the cute little Pom Pom bunnies!! Have a great week and Happy St Patrick’s Day! Now these are perfect for the week….Happy Easter Evija!! These are too cute! Pinned, tweeted, and shared. Thanks for sharing at Merry Monday, hope to see you again next week! Thank you Chelc and thanks for hosting such a great party! Oh my goodness these are so cute! Awesome job! Adorable but how wide (size) are the pieces and card board. I tried making them and mine look kind of floppy. I guessed 2 1/2 for head and 4” for body and 50 wraps but they don’t look as cute and round as yours. Suggestions? Help please. Hi Beverlee thank you , I can’t recall now how big the cardboard was but the secret is when you think you have enough yarn wrapped , wrap some more and then more !!! The thicker the yarn the fluffier the Pom Pom .. I made a Pom Pom cushion and honestly I went as thick as I could and the Pom Poms turned out perfect .. Thank you. I will keep wrapping.